As Wired proclaimed the death of the web, it struck me that many times over the years, I had read articles about how the paper book was dead, or about to die. It took only a Google search to find that the headlines proclaiming or questionning the death of the traditional (read: paper) publishing industry are legion. Since it is a topic that touches us closely, I thought I'd share my findings and some thoughts with you. I’m waiting for someone to lament that these kids today don’t read. But they read a lot. They may not read books as much and they may read their share of inspipid personal pages, but they also can now find and read information that is more relevant to them and that is recommended by people they trust thanks to the technology of the internet. I think — or, to be more accurate, I hope — that this will lead to more of a true meritocracy of writing. Good writing will rise. Bad writing may still be on the airport newsstand shelves. But then, when you’re braindead on a six-hour flight, sometimes a braindead book is still just what you need. take a book over any of the interactive tools they’re building at MIT or Disney. Books give you access to great minds of the past, and they do a better job than any other medium I know of transporting you to those times and places. Honestly, I think the various declarations of “Print is dead in 5 years/10 years/already dead” are missing the broader picture. There are many moving pieces to making digital books dominant, and they aren’t as simple as “prices go down/availability goes up”. 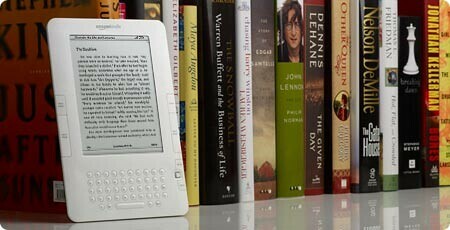 Consumers need to be comfortable with ebooks, the content and hardware need to work well together, and the most important part is remembering that just because ebooks may become dominant does not mean paper books are going to disappear. Internet connectivity and multimedia capabilities give us an opportunity to rethink what a book is, and even re-imagine the art of storytelling. [Books] are frozen in time without the means of being updated and corrected. They have no link to related knowledge, debates, and sources. Because books from wikis are of a different nature. They are rather a picture than a freeze, something like what Polaroid is to traditional photography. You can make your book, and remake it a year later, jsut to see the changes in the topic you've chosen. The content being online to start with, they actually do give links and sources and you could even print the talk pages of Wikipedia if you wanted to follow the debate on a topic. Although we don't exactly print out books that do storytelling in the strict sense of the term, our books tell stories of how knowledge evolves. And the sum of human knowledge, at that. I am also still convinced that nothing replaces paper when it comes to annotations (ah, the feeling of conversing with the author that writing an exclamation mark with a pen in the paper margin gives! ), personalisation (nothing compares to giving a paper book rather than send a pdf, I think), or to some extent, practicality (book on the beach, losing your book, taking your book in places where a Kindle or an iPad wouldn't survive...). I guess I am biased. After all, we do paper books. But I'm curious what you all think. What's your take on the future of the paper book? Should we also go digital? Why do you even create and buy PediaPress books? Does paper have for you the same attraction that it has for us? Tell us in the comments.